What Do I Do if My Denture Doesn’t Fit? If you happen to notice discomfort or irritation while wearing your dentures, that’s a sign that they no longer fit properly. You may also develop oral sores if they don’t fit right. If you notice these signs, the first step you should take is calling your dentist in Jacksonville. They can schedule an appointment and meet with you to determine the best treatment. What Can a Dentist Do to Help? In the event your denture in Jacksonville loses its fit, your dentist has two options: either reline your current denture or replace it entirely. There are two types of relines to choose from. These consist of a soft reline or a hard reline. Soft Reline – Soft relines are generally more popular because they tend to be more comfortable for patients. The reline is done with a liquid polymer, which is layered into the denture to provide more depth and cushion. If the reline is done chairside, it can be done in a single visit. However, since the polymer is more porous, it may require fine-tuning sooner than if you did a hard reline. Hard Reline – The process of a hard reline is very similar to a soft reline, except for one major difference. The material used to complete the reline is more similar to the base of the denture. Therefore, the result of the reline will be more permanent and last longer. However, this method is more likely to be sent to a dental lab, leaving you without a denture for a short period of time. What are the Risks If I Don’t Go to My Dentist? 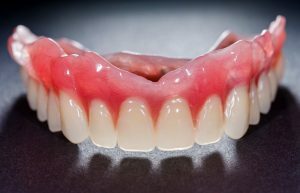 A quality denture can last for 5 to 7 years if properly cared for, but only if you visit your restorative dentist in Jacksonville for regular checkups. If your denture isn’t fitting properly, schedule an appointment with them today! Dr. Jignesh Patel earned his Doctor of Dental Medicine while attending Nova Southeastern University in Fort Lauderdale. After graduating, he moved to Jacksonville with his wife to provide patients many dental services and necessary products, including dentures. To learn more about how he fixes your dentures or learn more about the practice, contact him at (904) 262-9466 or visit his website.